What makes a book valuable and rare? The rarest books are pursued with the passion of a collector, or the book lover who wants to personalize a memory. There is a certain status in owning a first-edition of a classic like Charles Dickens‘ A Tale Of Two Cities from 1859. Or the book may be treasured because the author has signed a copy and made personal notes in the cover. It all comes down to supply and demand. It may be that the value of a book relates to the historical period when it was written. It may be that renewed interest in the Russian Revolution of 1917 may make books from that time collectible. or in some instances only a few copies of a book exist and so the books are valuable because they are scarce. Other books are rare and highly-prized simply because of their age. In the world of collecting books, antique books can go back to the beginning. Johannes Gutenberg developed the moveable-type printing of books in the 1440’s with the popularized copies of the Bible. A Gutenberg Bible printed in 1456, for example, would be extremely valuable and only offered at the most prestigious, in-person auction. For most of us, however, we may be on the hunt for a rare book that is important only to us or to a family member. Our Grandmother may fondly remember a children’s picture book that she had growing up. The book may be out-of-print but it may be worthwhile to buy it as a thoughtful gift. 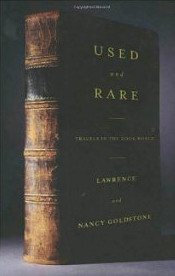 Our Used Book Search is a great way to find rare books online. It is an easy-to-use portal on the internet to find these valuable books. Rare and out-of-print books may not be carried at traditional, brick and mortar bookstores in your area, or their custom-ordering fee may be too high. A rare book collector can shop through the internet to find the best price and book condition when considering a purchase, or at least a bid. An antique book’s condition may be the most important part of the purchase if the goal is to preserve it in a private library. You will find the most detailed description for the most-treasured book. Detailed photographs and multiple paragraphs of text can be reassuring when buying an antique book without seeing it first. The more research you can do on a book, the more confident you can feel in making a secure purchase. After performing your search, click on “read more about this book” link next to the book which takes your fancy, for product dimensions, number of pages and other detailed information that can help you decide whether to make a purchase. Once you have decided that the book you want is indeed the one being listed, then you can compare prices from the different book sellers, such as AbeBooks, Amazon or Alibris, using the ‘compare prices for this book’ button. Sometimes www.usedbooksearch.net will lead you to a unique seller that has a geographical connection to the author of the rare book. We hope that we can help you find that allusive, soon to be treasured unique and rare book! This entry was posted in Book Buying Advice by admin. Bookmark the permalink.